Today I am looking into setting up IIS 7 on a new Windows 2008 server and getting it to serve an ASP.NET 2.0 built Web Site. I am used to doing this using IIS 6 on Windows 2003, but it looks like things have changed quite a bit with IIS 7. In my case the IIS 7 setup on Windows 2008 has to happen on a remote server so before I start configuring things I am testing setting up IIS 7 on my development machine which is running Windows 7. I am hoping this will give me a good basis even though the version of Windows is different. 1) I click ‘Start’, then ‘Control Panel’, and then browse to ‘All Control Panel Items’. (** Did I mention how irritating I find the new Windows ‘Feature’ of limiting what one sees under the traditional ‘Control Panel’ so that one has to default to ‘All Control Panel Items’ now instead). 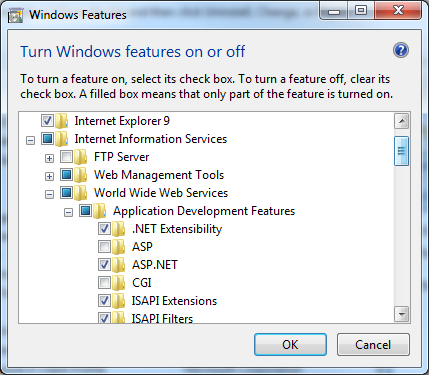 2) Then click ‘Programs and Features’, and in the pop-up window click on the option ‘Turn Windows Features On or Off’. 5) Once the options are selected click ‘OK’, and follow the installation instructions to complete the setup. This should complete the base installation of ASP.NET for the server. The next step is to set up a properly configured Web site, which may be a bit of a challenge since Microsoft has so completely altered the interface. For example, in IIS 7 Microsoft has moved the Application Pools section which I am still working on tracking down. Luckily the WebService Extensions section remains intact so I can specify what version of ASP.NET I would like the application pool for my site to run under.